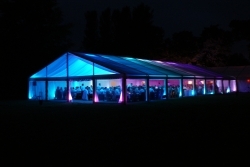 RJCC Events offer many different types of marquee which are described below. Planning a party, wedding or other event could not be simpler with in house production - meaning a one-stop-shop supplier for you or your clients. When we have performed a site visit to measure up for the marquee we can then look at all of the different options available starting with flooring, carpet, furniture, linen and then onto the bar, catering, entertainment and of course how to power it all. This can seem quite daunting when you are planning your first party and so this is where one of our event managers can come in to play who can organise your event from start to finish or provide individual services. We are happy to provide as much or as little as you want. 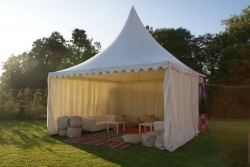 The marquees and tents we offer are competitively priced - especially local to us in Oxford. We are more than confident that our prices will not be beaten for the quality of goods and service that we provide, but if you have received a more competitive quote, we will try our hardest to beat it upon its presentation to us. 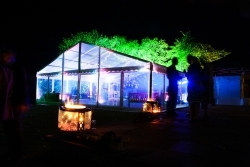 The most popular marquee we recomend when planning parties is a clearpsan frame marquee. These marquees are known as clear span structures because they have no central poles, like traditional marquee with guy ropes, which makes for an unobstructed view and clear open space inside. This makes them perfect for weddings, birthday parties and corporate events alike. 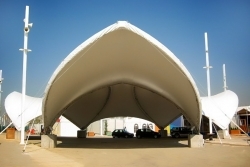 We even use these marquees as an affordable solution to cover festival stages with an open gable end. The most popular marquees we recommend for most of our events are free standing aluminium frame structures without centre poles or guy ropes. Usually we supply them with plain canvas white walls and roofs, however they also look stunning with transparent windows and roofs. They are modular in design which means you can 'bolt-on' extra bays to make the desired length. 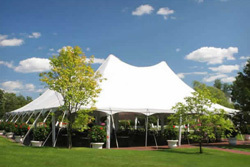 Traditional marquees are elegant and sophisticated in their design. The swooping lines of the roof fit in with the classic English country garden theme making them a popular choice for weddings and events that call for that extra bit of charm. This type of marquee requires 1.5m (5ft) space for guy ropes and pegs around the outside. Supporting poles in the middle of the structure can be decorated with material, ribbons, fairy lights or flowers. They look even more stunning when populated with round paper lanterns, bunting, festoon lighting around the outside or along the peak and linings of your choice. 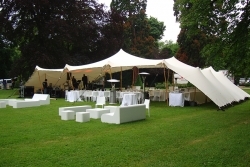 Capri marquees are wonderfully unusual, extremely ey-catching and can be zipped together, with versatile closed white canvas sides, PVC windows or open sides. Typical capacities range from 35-600 people standing and 25-440 people seated as several capri marquees can be joined together. 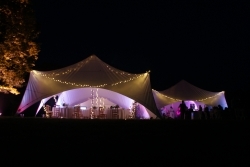 In the photo we used fairing lighting around the poles of the inside and around the outside of the tent for a wedding at Cornbury Park, Oxfordshire. "Just a quick note to say thanks very much for the great job you did at our recent Wedding. We were both very impressed with your professionalism in helping to design the lighting; the fairy lights in the marquee and uplit trees look fantastic. We both also loved the disco and were very impressed with the both the quality of the equipment and your DJ!" 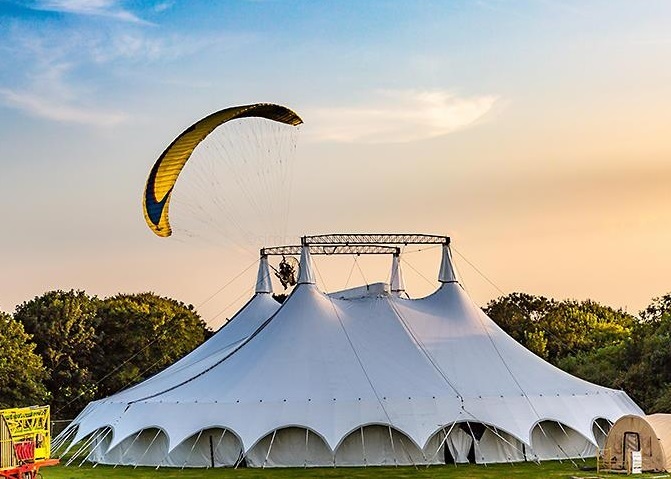 RJCC Events have a strong relationship with Saddlespan, TriSpan, DuoSpan, QuadSpan tents suppliers for festivals, private parties and corporate events in Oxford and all over the UK. We use our experience in creating the perfect environment for your event, designing the perfect lighting and sound package to suit the structure and your audience. The saddlespan, tripsan, duospan and quadspan structures can all be used not only on grass but on solid ground such as tarmac and concrete using weighted ballasts. The stunning, curvaceous design of these SaddleSpans create a spacious and spectacular area for showing off your brand or product and look beautiful in any space. PLEASE NOTE: Professional Big Tops are generally speaking always round. Our supplier's Big Tops are not traditional marquees painted in stripes and passed off as a Big Top. A marquee by comparison is smaller, flimsy, not lightproof and has limited rigging points. Big Tops are big, strong, lightproof and have lots of rigging points. 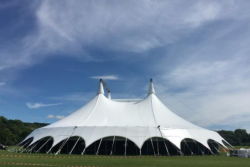 Some pricing examples: A Big Top circus style structure for 2000 - 3000 people standing or for 300-600 guests seated costs around £11,000. If you need technical production, such as a stage, sound and lighting, bar etc (which we can also provide!) you will need to allow space and budget for this too.